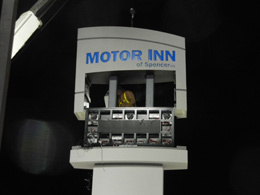 Towering majestically over the Motor Inn Spencer Inc. Auto Group dealership (Spencer, Iowa), a new custom pylon sign with pole cover and integrated electronic message center (EMC) has no problem getting the message across.Working with Avery Brothers Sign Company of Sioux City, Iowa, the Signs By Benchmark team created the customized version of their Standard Model #15 . 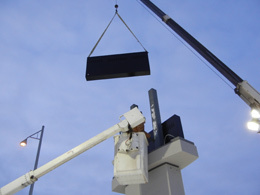 Measuring 9′ 3″ wide x 24′ high x 37″ deep, the double-sided sign was constructed to fit around the EMC. To achieve a smooth, professional look and compliment the EMC, copy was recessed directly into the sign face. The sign and pole cover were finished in faux granite, achieving the modern, molded appearance the customer felt would best portray his business image. 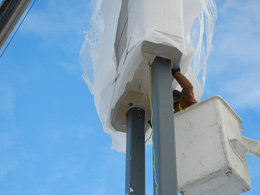 Despite winter weather conditions, installation went smoothly. 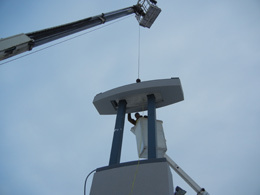 Once again, Signs By Benchmark’s attention to detail, flexibility and customizing abilities prove themselves. 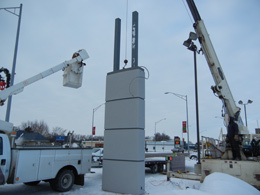 Collaborating with Avery Brothers Sign Company, they were able to create the perfect signage for this project. 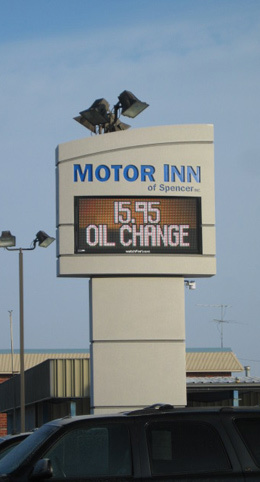 Call the Signs By Benchmark team today at 605-886-8084 or 800-658-3444 to discuss your unique signage needs. They can turn your ideas into reality!